Today’s Manchester Guardian gives an unchallenged outing to metropolitan whinger Germaine Greer on the subject of the Yorkshire Sculpture Park, near the heart of our 15-million-strong Supercity. If you can manage to get yourself to West Bretton near Wakefield, you may see some of them dotted round the 500 acres of the Yorkshire Sculpture Park; others may be displayed in four indoor galleries. The park is seven miles from the nearest railway station and a taxi will cost you a tenner, which Londoners have to add on to the £112.50 – the least the day return will cost a single adult. This is only the price that we have to pay to visit the vast majority of the national collections that are housed in, er, London. The train runs both ways, you know. You don’t have to take a taxi. We have buses. And the driver may even respond to a cheery wave. Try that on the Tube and you’ll be arrested. 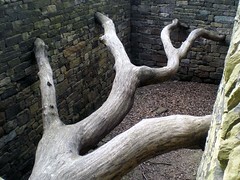 Thanks to the YSP, my seven-year-old can bore for Yorkshire on the life and works of Andy Goldsworthy. It’s not just the sculptures. We’ve got your weapons too, and we’re not giving them back.